PRESIDENT ELECT DONALD Trump is selling a Christmas ornament of his infamous red hat for $149 (€141). An email sent out from his official website to his tens of millions of subscribers urged Trump fans to buy the expensive ornament from his online shop. The decoration is in the shape of Trump’s infamous Make America Great Again hat and has been “finished with 14 carat gold”. The email tells readers how Trump loves Christmas and that he “makes a point of proudly saying ‘Merry Christmas’ every chance he gets”. Trump had funded his own campaign and in October alone, he had spent $238 million. To get that money back, he’d have to sell 1,597,315 ornamental hats. 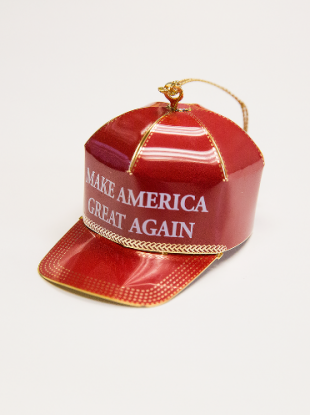 Email “Trump is selling gold-trimmed Make America Great Again Christmas ornaments for $149”. Feedback on “Trump is selling gold-trimmed Make America Great Again Christmas ornaments for $149”.